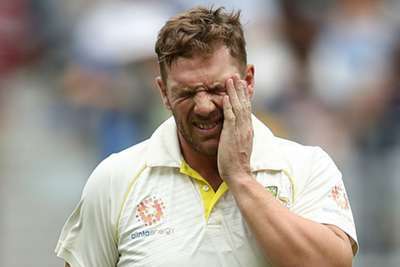 Australia opener Aaron Finch was cleared of serious damage after taking another blow to the finger on day three of the second Test against India at Perth Stadium. The opening batsman grimaced when he was struck on the right index digit off a sharp delivery from Mohammed Shami and retired hurt on 25. Finch had twice taken a blown on the same finger when he was done for pace by team-mate Mitchell Starc in the nets. The limited-overs captain has not suffered a fracture, but it remains to be seen whether he will be able to bat on a fourth day which Australia will start with a lead of 175 on 132-4. Australia spinner Nathan Lyon said: "I'm still not sure whether he's going to bat, so if he bats he bats, if he doesn't we'll just have to make do with whatever we can get to. "But great news for Aaron that he's been cleared of any serious damage." Lyon claimed figures of 5/67 on a gripping day which saw Virat Kohli somewhat controversially dismissed for a majestic 123, Peter Handscomb adjudged to have held on to a slip catch off Pat Cummins. Lyon's 14th five-wicket haul in the longest format moved him into the top 25 on the all-time list of Test wicket-takers and the spinner said there is plenty more to come. "It's a bit surreal," Lyon said when informed he had risen above Allan Donald. "To pass the great 'White Lightning', it's pretty special. "Those types of milestones for me personally haven't really sunk in. I don't think I'm at the top of my game yet. I think I've still got a lot of improvement, a lot of learning about the game and about off-spin bowling. "I believe there's a lot around the corner for me if I keep working hard and keep wanting to get better. "At the end of my career I'll sit down with my family and friends and hopefully have a beer with mum and dad and my brother and everyone else and just go 'okay, that's where we got to, that's pretty special'. But I've got a lot to achieve in my eyes."